Heat oven at 350°F. Line 17x12-inch cookie sheet with cooking parchment paper or silicone nonstick baking mat. 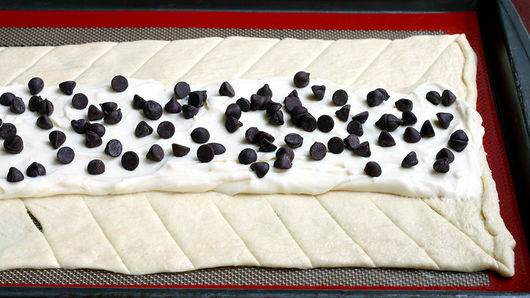 Unroll dough onto lined cookie sheet; press dough into about 16x10-inch rectangle. With sharp knife or pizza cutter, cut 1 1/2-inch-long slanted cuts 1 inch apart along both long sides of rectangle, leaving center of dough uncut. Make sure you have the same amount of cut strips on both sides. In medium bowl, beat cream cheese, sugar and vanilla until smooth. Spread mixture on uncut center of dough. 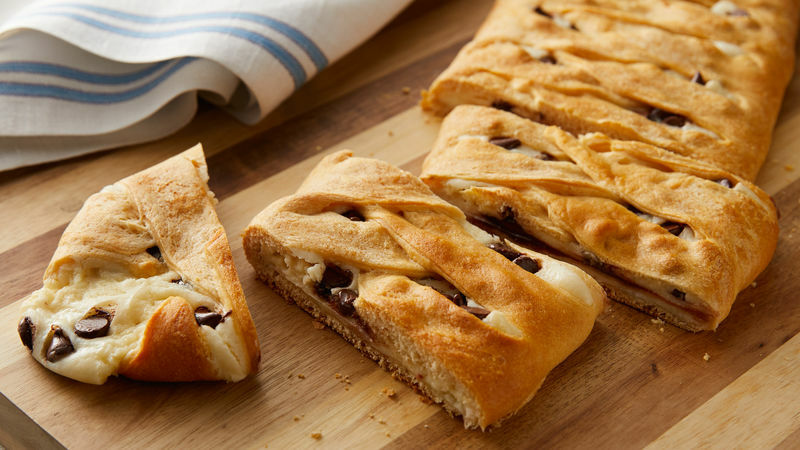 Sprinkle chocolate chips over cream cheese mixture. 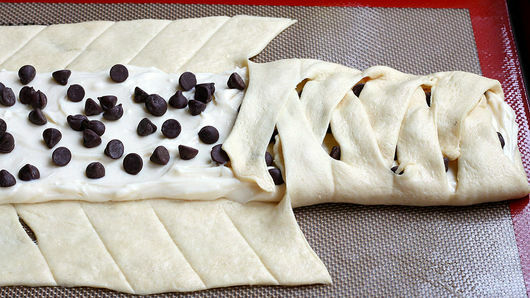 Braid dough by crossing strips over filling, alternating from side to side. At end, trim off any overhanging dough. Bake 20 to 22 minutes or just until golden brown. Remove from cookie sheet to bread board, serving platter or cooling rack. Cut into slices to serve. Best served the same day. The filling is quite versatile. You can add more or less chocolate chips. Or use rum-soaked raisins, nuts or a combination of the two. Or fresh berries! Use grated lemon peel and lemon extract instead of the vanilla for a citrus touch! Be creative! If you can’t find the refrigerated seamless dough sheet product, use an 8-ounce can of Pillsbury™ refrigerated crescent dinner rolls, and pinch the seams and perforations to seal.